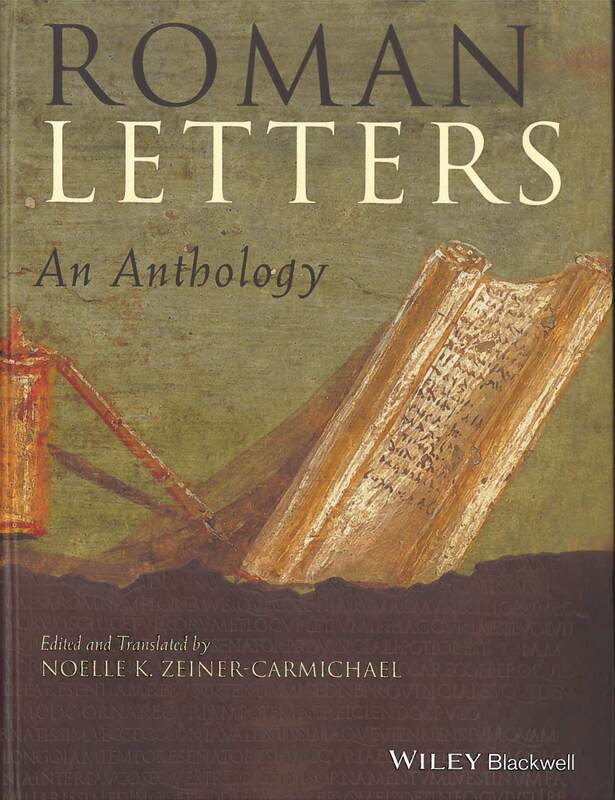 Dr. Noelle Zeiner-Carmichael’s new book, Roman Letters: An Anthology (Wiley-Blackwell, September 16, 2013) ISBN 978-1444339512, is now available. Roman Letters offers a diverse and rich selection of original translations of ancient Roman letters spanning from the 1st century BCE to the 2nd century CE. The wide range of selections includes translations of prose and verse letters, letters sent and received, canonical epistolary authors such as Cicero, Ovid, Pliny the Younger, and less familiar texts including papyrus letters from Oxyrhynchus, Egypt, and wood leaf tablets from the Vindolanda fort in Britain. In addition, the volume contains representative New Testament letters and some illustrative excerpts from ancient epistolary theorists. A valuable introduction includes discussion of the letter as a genre, as well as the practical issues of letter-writing materials and letter delivery in the ancient world, and includes maps to help readers visualize the distance many letters traveled, and an index of authors and topics. An accompanying website offers additional, complementary letters. The MOJA Arts Festival Parade will begin on Thursday September 26 at 5:30. It will begin at Marion Square, head down King Street, turning on Market Street and end at the Custom House on East Bay Street. Join us Saturday October 5, 2013 for the 3rd Annual “Be Fit” Through West African Drum & Dance! One day intensive fitness & cultural festival taught by internationally renowned musicians & dancers! You may register for workshop classes either by mail (until postmarked date September, 20 2013) or online. The advance purchase price is available until October 2, 2013. Thereafter, all workshops must be purchased at the door. To register by mail, please complete the Pre-registration Applicationand send payment via cashier’s check, money order or bank check to Wona Womalan West African Drum & Dance Ensemble, 205 Saber Street, Summerville, SC 29483. Checks are made payable to Wona Womalan. Please no personal checks. All participants who pre-register (online or by mail) will receive workshop tickets at the conference registration desk. Photo ID is required to receive pre-registered workshop tickets. Go to : http://wonawomalan.com/Wona_Womalan/SCADF.html for more information! Charleston, SC– The Preservation Society of Charleston will unveil its final modern Civil Rights era historic marker on the campus of the Medical University of South Carolina in the Basic Science Building Auditorium, 173 Ashley Avenue. The event will be held Tuesday October 1, 2013 at 3 p.m. Event parking will be available at MUSC garages provided that guests show their event program. This event is free and open to the public. Guest speakers include local Civil Rights leader Mary Moultrie and Department of Emergency Medicine assistant professor Dr. James Tolley. 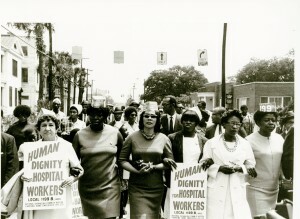 Civil Rights marches along city streets such as Ashley Avenue were a pivotal moment in the modern Civil Rights movement in Charleston, SC. On March 20, 1969 Medical University hospital workers, led by local activist Mary Moultrie and other national leaders of the movement, began a 113 day strike to end unequal pay and unfair treatment of African American nurses. The Medical University rehired all strikers and established grievance procedures. In 2011, the Preservation Society placed “Civil Rights Era Sites” on its inaugural Seven to Save list. The Society enlisted an alliance of historians and preservationists, all committed to preserving and protecting African American history, to create a list of historic sites significant to the modern Civil Rights movement. With the help of this alliance and the greater community, the site of the Hospital Workers strike was selected. This event is made possible through our generous sponsors at MUSC. For more information please contact Aurora Harris, Community Outreach Manager at (843) 722-4630, aharris@preservationsociety.org or visit our website at www.preservationsociety.org. Founded in 1920, the Preservation Society of Charleston is the oldest community-based membership historic preservation organization in the United States of America. Our mission is to inspire the involvement of all who dwell in the Lowcountry to honor and respect our material and cultural heritage. Membership in the Preservation Society is open to everyone.